Sample experience letter for chemical companies for their employees. This is also known as experience certificate for chemical engineers working with chemicals. From the sample you can learn how to write experience letter for engineers by explaining thier duties and accomplishments during the job tenure. 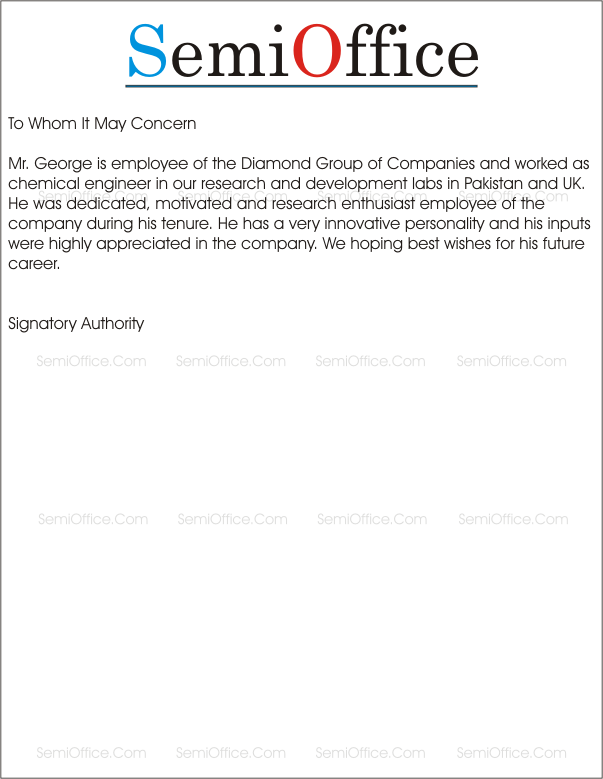 Mr. George is employee of the Diamond Group of Companies and worked as chemical engineer in our research and development labs in Pakistan and UK. He was dedicated, motivated and research enthusiast employee of the company during his tenure. He has a very innovative personality and his inputs were highly appreciated in the company. We hoping best wishes for his future career. It is to certify that M. ALI RAZA had been working as a Chemical Engineer for Axis Chemicals since 2005. We had a great time with this man as he was very committed to his work. He was a man of discipline. He had also won a lot of international awards in different projects. Due to his brilliant working he had been promoted to the designation of senior chemical engineer as well. We wish him a bright and successive future.